It’s officially June now, and hopefully you’ve already dusted off your grill and fired it up a few times already. 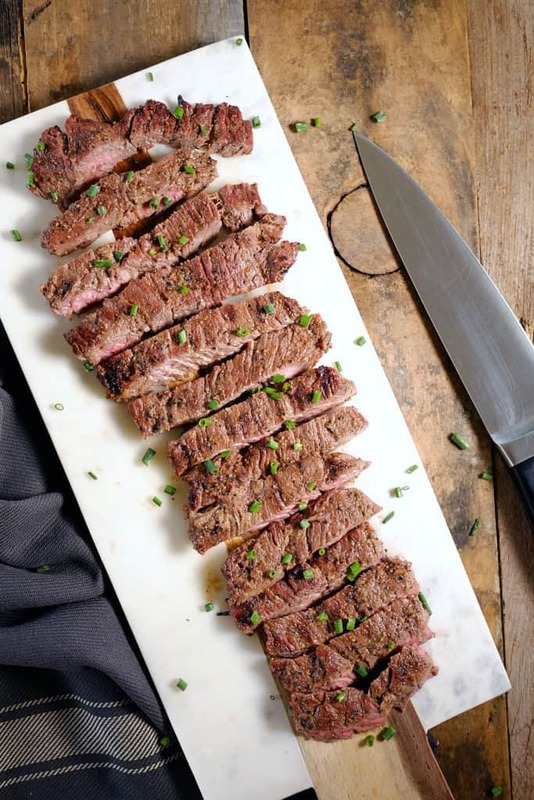 If you haven’t, this Paleo steak marinade recipe will get you motivated to grab a good cut of meat from the store (or your local butcher), throw it in this easy marinade for a while, and sear it over a hot grill. This is a go-to steak marinade for us. We use a version of this marinade to flavor a lot of our tougher cuts of steak like flank, skirt, hanger and flat iron. These are perfect cuts for a marinade because they are a little tougher and need some extra flavor. 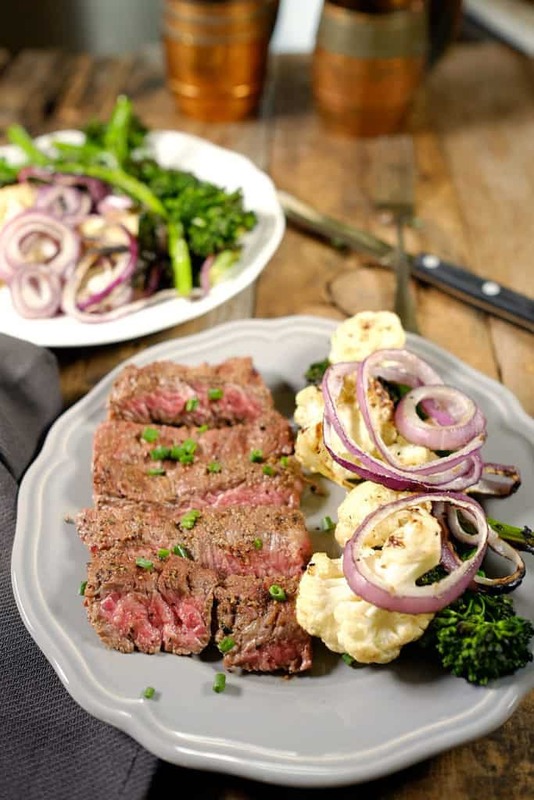 They also happen to absorb the marinade really well because they are a thinly cut steak – not to mention they are cheaper! If you are interested in learning a little more about these cuts of steak, head on over to this page for a nice little summary. Ok so tell me, if you read that summary, do you feel more informed to know which parts of the cow you are eating? Or do you prefer for the steak to just arrive on your plate without any knowledge of the cow and/or what part of the cow it came from? We are interested to know so leave us a comment and tell us how you feel about getting to know your cuts of meat. Now, onto this easy Paleo steak marinade. It takes only about 5 minutes to put together and is a basic, flavorful marinade that you can use over and over. It uses only eight ingredients that most everyone has on hand in their pantry and spice cabinet. If you don’t have any of the ingredients (like coconut aminos or apple cider vinegar) you can substitute another type of vinegar or salty sauce or just add water in place of the missing ingredient to get the right consistency of the marinade. This marinade will work for a cut of meat up to two pounds and can also be used on chicken, pork, bison or fish. Just mix up the ingredients in a zip top bag or shallow dish, add in your desired cut of meat and let it marinate for at least a couple of hours. Then, your meat will be ready for tossing on hot grill! 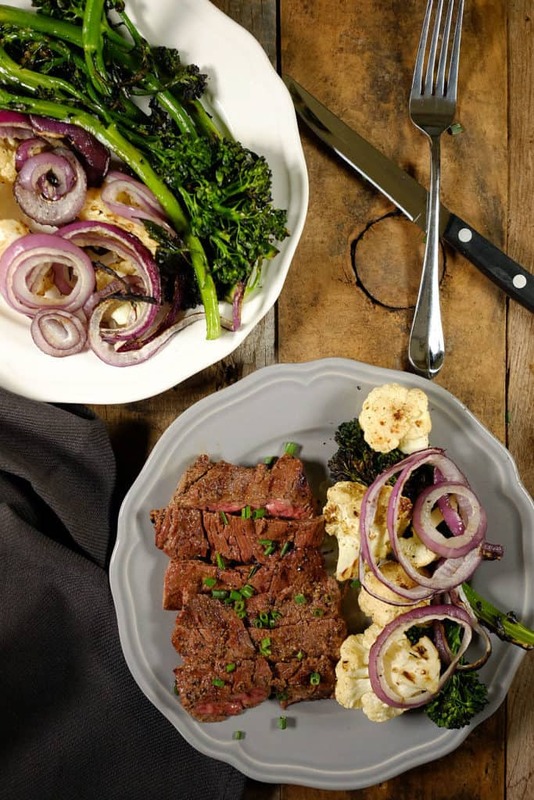 We paired our skirt steak with some grilled veggies for the perfect simple BBQ meal. Give this steak marinade a try for your next grilling adventure. Let us know how you like it by leaving a comment below, and tag us on Instagram @realsimplegood so we can check it out! 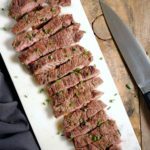 This easy Paleo steak marinade takes about 5 minutes to put together and is a basic, flavorful marinade that you can use over and over. Only 8 ingredients! Follow Real Simple Good on Pinterest for more delicious recipes! Combine all of the ingredients in a zip top bag or shallow dish and mix well. Add in your steak (or other meat) and mix everything to get the meat coated well with the marinade. Cover and refrigerate for at least 1 hour and up to 24 hours. Remove from the container and get to grilling! Just wondering how many lbs of meat this recipe is for. Thanks! It looks great! The marinade will work for a 2 pound cut of meat. When you say use over & over are you saying to keep the mixture to use on another piece of meat? Hi there – no you’d only use the marinade once, but it’s a recipe to use over and over. Does that make better sense? I am halfway through dinner and had to stop to tell you this marinade is AMAZING!!!!! Thank you so much! Tried this with Kangaroo steak. Delicious! This is tasty. We used it on a flat iron steak. This marinade is awesome! I had a bbq last night and used this marinade for my steaks and it got so many good remarks! Can we bake this when we don’t feel like grilling? How long would I bake it for? Do I have to flip it at a certain time? Depending on how thick the steak is, you could bake it on a sheet pan at 450° for about 15 minutes, flipping halfway. Watch it carefully and remove it when it is cooked to your liking. I won’t be cooking up all of my meat today. Do you think I can freeze the extra in the marinade so it will marinade as it thaws later? Yes, that should be fine for steak.